How effective is the scrutiny role of TDs? Theoretically, TDs in the Dail have a number of ways which they are able to scrutinize the government, the three main ways in which TDs scrutinize are through Parliamentary questions, committees and debates. 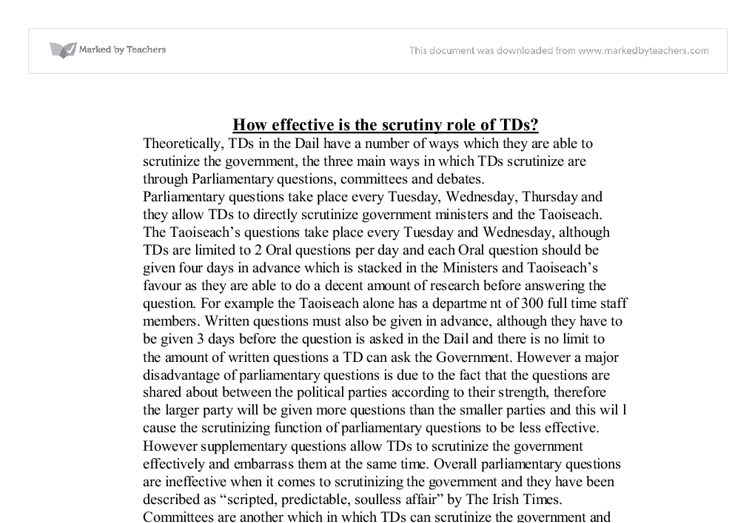 Parliamentary questions take place every Tuesday, Wednesday, Thursday and they allow TDs to directly scrutinize government ministers and the Taoiseach. 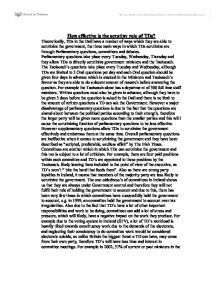 The Taoiseach's questions take place every Tuesday and Wednesday, although TDs are limited to 2 Oral questions per day and each Oral question should be given four days in advance which is stacked in the Ministers and Taoiseach's favour as they are able to do a decent amount of research before answering the question. For example the Taoiseach alone has a department of 300 full time staff members. Written questions must also be given in advance, although they have to be given 3 days before the question is asked in the Dail and there is no limit to the amount of written questions a TD can ask the Government. ...read more. For example, there are four paid positions within each committee and TD's are appointed to these positions by the Taoiseach, likely leaving them included to the point of view of the executive, as TD's won't " bite the hand that feeds them". Also as there are strong party loyalties in Ireland, it means that members of the majority party are less likely to scrutinize the government. The one-sidedness's of committees in Ireland shows us that they are always under Government control and therefore they will not fulfil their role of holding the government to account and due to this, there has been very few times in which committees have successfully held the government to account, e.g. in 1999, an committee held the government to account over tax irregularities. Also due to the fact that TD's have a lot of other important responsibilities and work to be doing, committees can add a lot of stress and pressure, which will likely, have a negative impact on the work they produce. ...read more. In large, these lead to little more than theatrical bickering between parties and so are limited in just how effectively they are used. A debate can also be called in the form of a 'motion of confidence', whereby the Opposition will table a motion of no confidence in the government, disparaging the work of one or several ministers. This can be effective in drawing attention to problem areas in particular ministries and has twice caused the dismissal of a government (1982 and 1992). It can be argued however, to have much the same effect as adjournment debates, with the government simply tabling a motion of confidence in themselves. In addition to this, ad hoc debates can also be called in order to address issues of immediate concern. These perhaps prove the most effective form of debate in the Dail, allowing the Opposition to air their grievances on government failings but also providing cross-party consensus on matters of major development. ...read more. In Srebrenica, approximately 8,000 Bosnian males were brutally murdered. Also, the UN aid convoys possessed enough food aid to offer support to the poorest regions of Bosnia, however the UN frequently prevented the transportation of the aid to the regions where conflict was at its fiercest in an effort to prevent diplomatic efforts to reach a settlement from being undermined. * Being open to criticism and advice- criticism improves the performance business. It also improves personal development. The advantage of criticism is that if criticised on work they can improve it and act upon the comments. The disadvantage is that it may demotivate some employees.